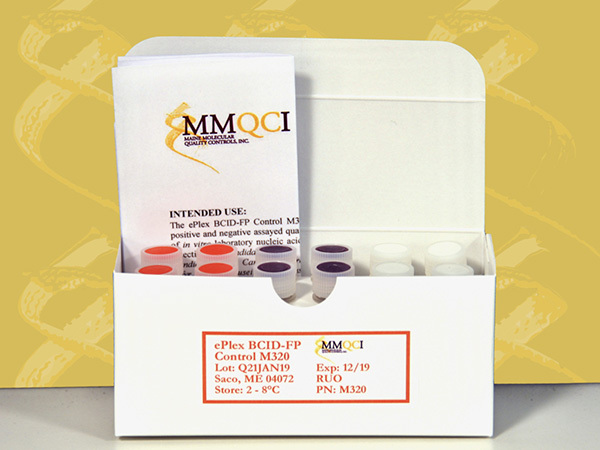 The ePlex BCID-FP Control M320 is intended for use as an external positive and negative assayed quality control to monitor the performance of in vitro laboratory nucleic acid testing procedures for the qualitative detection of Candida albicans, Candida auris, Candida dubliniensis, Candida famata, Candida glabrata, Candida guilliermondii, Candida kefyr, Candida krusei, Candida lusitaniae, Candida parapsilosis, Candida tropicalis, Cryptococcus gattii, Cryptococcus neoformans, Fusarium, and Rhodotorula on the ePlex® Blood Culture Identification Fungal Pathogen (BCID-FP) Panel performed on the ePlex System (GenMark Diagnostics, Inc.). The ePlex BCID-FP Control M320 is composed of synthetic DNA specifically designed for and intended to be used solely with the ePlex BCID-FP Panel assay. This product is not intended to replace manufacturer controls provided with the device.